It's tough to start a Thursday Night Football QB, especially when your other QB is Philip Rivers going against a banged up San Francisco 49ers defense. However, when that QB is Jared Goff, you might want to reconsider! Goff and the Los Angeles Rams exploded for 465 passing yards and five passing touchdowns. Goff completed 26 of his 33 pass attempts against the Minnesota Vikings. He was started by just 38% of Yahoo fantasy football owners. 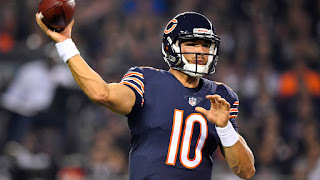 Mitch Trubisky is a free agent in all four of my Yahoo leagues. He torched the Tampa Bay Buccaneers defense for 354 passing yards, six touchdowns and even 53 rushing yards! He did all of that on just 19 completions - 26 pass attempts as the Chicago Bears cruised to a 48-10 win. Andrew Luck just had a career game, and barely any fantasy owners witnessed that, with just 33% start on Yahoo. Luck set a career high in passing yards with 464 thanks to a career high 62 pass attempts! His 40 completions (4 touchdowns) saw him complete 64% of his passes in Week 4. Derek Carr is now averaging 343 passing yards per game but his four touchdowns on Sunday tripled his season total and he has more interceptions (7) than TDs (6). Marcus Mariota completed 30 of 43 pass attempts for 344 yards and his first two passing touchdowns of the season. He did this in a win over the Philadelphia Eagles. The offense finally got going, and it was Corey Davis (27% start) who finally had a breakout game. He converted 15 targets into 9 receptions for 161 yards and a touchdown. The Tennessee Titans are now 3-1 and have defeated the Jaguars and Eagles in back to back weeks. They get the Buffalo Bills in Week 5.